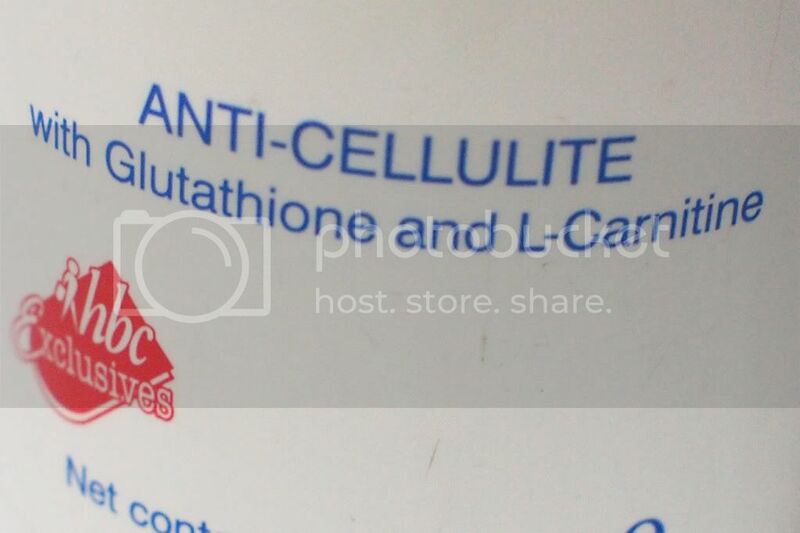 Cellulite seems like a universal problem. Since August was my whitening month, I figured to find a product that can offer body firming effects alongside fairer skin should definitely be part of the list. 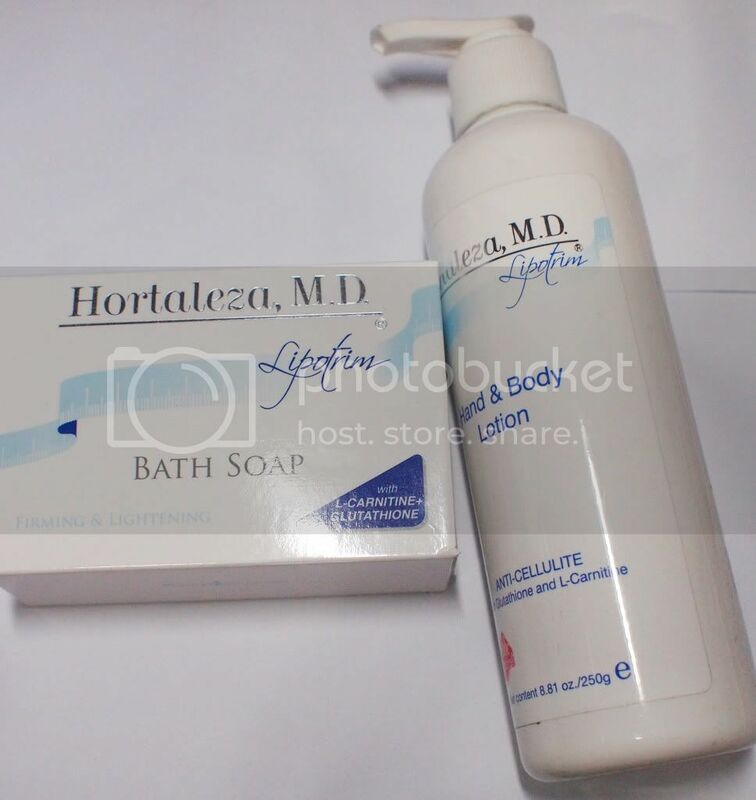 Luckily, HBC introduced me to one of their Hortaleza MD products, and this pair is a cool way to whiten and tone up. First of, Lipotrim Bath Soap with L-Carnitine and Gluthatione. According to the box: this firming and lightening bath soap helps make skin firmer, smoother and more toned-looking. It lightens and moisturizes the skin while helping improve the appearance and texture of dimpled skin. It is also formulated with an anti-oxidant complex that is suitable for face and body use. I know that's a lot of scientific jumble but I kept the soap's packaging to be able to share with you (and make sense for you) some of those outrageous names! It's good to be informed right? Glycerin, which is a humectant (attracts water), calls for your personal care products' outstanding smoothness (glide). Sodium Lactate, is this milk? No. It is a dairy-free component that serves as a great moisturizer. Carnitine, it speeds up energy metabolism which is helpful in reducing fat mass. Caffeine, when absorbed by the skin, reduces that "dimpled-skin" you don't like around your thighs! Vitis Vinifera (Grapeseed) Extract has high levels of vitamin E. As you all know by now, to preserve youthful looking skin, one should keep the vit E's in-tact. Menthol, that explains the delicious tingly feeling after shower! Talking about menthol, let me share Lipotrim's pard-ner, the Lipotrim Firming Lotion (Php 350). I want to hang myself for not keeping the bottle (I sold it because I'm holding a plastic recycling program as part of my being pro-environment--it's a fund raising for a Gawad Kalinga community near us). Anyway, let me just share my experience with the Lipotrim lotion, expect raves. First use of the soap, I noticed its consistency. It was so thick. I joked about it being a body butter in a bottle. I'm amazed it was in a pump bottle packaging because the lotion really was so thick but surprisingly, it wasn't sticky! I love it! Similar to the soap, it smelled so sweet! Field of berries, hello there! I have finished my bottle already, as implied earlier, and I do swear when I see a Lipotrim set on shelf I would get me a bottle because its such a delicious experience to slather on the thick lotion on my body while being embraced by the fragrance of grapeseed, I presume. I love it! I love how it feels like its body butter and not just lotion because I feel assured I'm moisturized intesively; that while whitening and firming the skin doesn't hurt at all! I love it! More than what the soap leaves, the lotion counterpart leaves an exhilirating menthol experience... most extensively felt on my bum area! haha It was so cold on the skin, I felt so refreshed; that while whitening and firming, again, doesn't hurt at all! I love it! If you are skeptic, I would suggest you skip the soap and go for the lotion only. I am hands down, the lotion is a must-have. Now I feel frustrated, hoping there's a bottle out there waiting for me. I guess the reason it's not on shelf is because it sells like hotcakes! I am not surprised, I want more of it myself! How about you, what's your recommended whitening and/or firming product? Hi Didi, sorry but i haven't tried it yet..